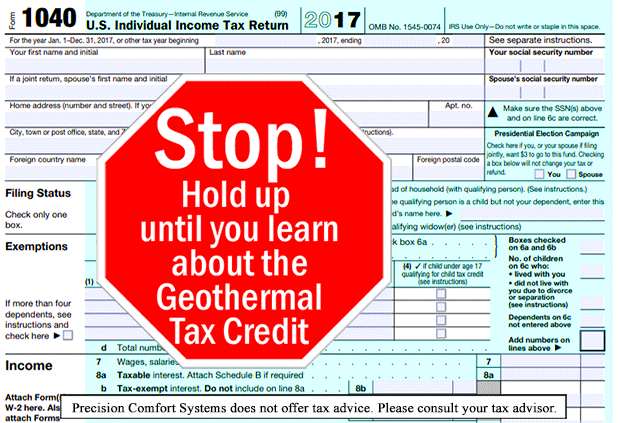 How does the 2017 geothermal tax credit work? We cannot offer you any tax advice, but be aware that the geothermal tax credit has been revived and is retroactive for residential geothermal systems installed in 2017. Here’s what we know. Assume you have $12,000 of qualifying geothermal heating/cooling installation expenses. 30% of the qualifying expense = $3,600. Assume you have a federal tax bill of $8,600. Subtract the credit and your new tax bill is $5000. You just saved $3,600! For 2017 and for 2018, the geothermal tax credit is 30%. But it decreases in 2020. Here’s how it works. Good news, Bad news. Good… the credit is retroactive for 2017. The bad news, there is currently no provisions or instructions on how to claim this credit on your 2017 return. You may need to delay your 2017 filing, or amend it, or perhaps the credit will be allowed on your 2018 return. Regardless, it is a significant credit so you need to keep track of the decisions coming from the IRS in the near future. Bookmark this blog address and check for updates. I will try to get the new information out as soon as we have it. Assuming the revived credit works as it did in the past, the qualifying geothermal system must be installed in a home you own and use as a residence. (Rentals were not allowed, but second homes qualified in the past.) Also, the credit is non-refundable, but can be carried-over to a future tax filing year. In years past, the credit was claimed on form 5695. At a minimum, you will need something from your installing heating contractor showing the amount you spent on your geothermal system. You should also have supporting information on the efficiency rating of your system. You can download an AHRI rating certificate from https://www.ahridirectory.org. First find your model number on all your units and then input this in the directory model number search field. The site is a bit persnickety on getting the numbers right, so if you are a Precision Comfort Systems customer and the site does not work for you, give us a call. For our customers getting a geothermal system installed in 2018, do nothing now. When your system is completed, we will send you some information.